A live hand grenade dating back to World War II was found inside a building on Route 52 in Lake Carmel Monday. Kent Police Chief Alex DiVernieri said the munition was located by a demolition crew hired to remove debris from the former LaRussell&rsq… Please login below or purchase a subscription to the Putnam County Courier to access this content. Putnam County will soon be home to a pair of explosives detection canine teams thanks to Uncle Sam. The Sheriff’s Department successfully won a grant in 2013 to cover the cost of the dog, a canine vehicle, and training and equipment. At last w… Please login below or purchase a subscription to the Putnam County Courier to access this content. Above: A delicious turkey dinner was prepared by Theresa Kovar and John Tsikalakis inside the kitchen at the county jail. Sheriff Smith approved of the feast. Right: In a recreation area, the sheriff offered words of encouragement to an inmate playin… Please login below or purchase a subscription to the Putnam County Courier to access this content. A freak accident late Monday afternoon seriously injured an employee of a popular Putnam nursery. Authorities said the victim, who was not identified, survived due to the fact that he is a “giant” of a man standing 6 feet 5 inches tall a… Please login below or purchase a subscription to the Putnam County Courier to access this content. The Putnam Sheriff’s Department on New Year’s Eve identified the woman who jumped to her death from the Veterans Memorial Bridge as Kathleen Kondrat, 69, who had resided on Shady Lane in Brewster before relocating to Danbury six months ago. Kon… Please login below or purchase a subscription to the Putnam County Courier to access this content. 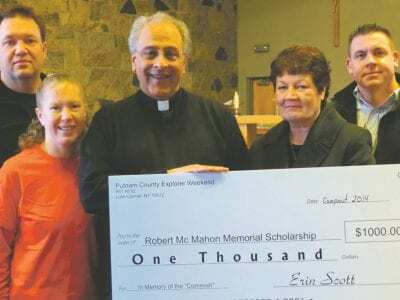 A check for $1,000 is presented Monday to Father Anthony Sorgie at St. James Church by Drew Kinash and Erin Scott while Donna McMahon and her son Brendan look on. 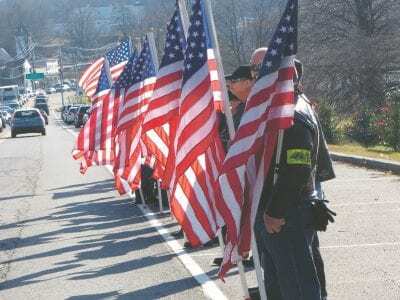 In life, Putnam’s former Commissioner of Emergency Services Robert McMahon was a … Please login below or purchase a subscription to the Putnam County Courier to access this content. The acts have been selected. Ticket sales are underway for the Brewster Education Foundation’s Brewster’s Got Talent show next Friday, January 9. Students and adults alike will perform at the BHS Performing Arts Center for a first prize… Please login below or purchase a subscription to the Putnam County Courier to access this content. With a number of cases of confirmed influenza reported across Putnam County, several resulting in hospitalization, the Putnam Health Department has scheduled a “last-chance” flu clinic for next Tuesday, January 6, at the Health Departmen… Please login below or purchase a subscription to the Putnam County Courier to access this content. 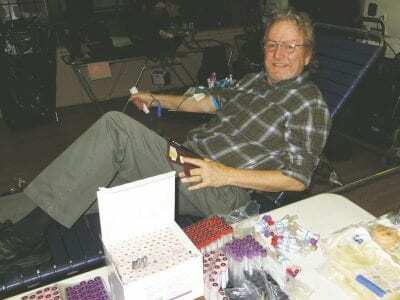 Top: Nick Hanrahan of Kent donates blood last Friday evening. Above: Jennifer Head of Brewster donates blood while texting on her phone. Seventy-nine pints of the gift of life were donated Friday during Putnam’s semiannual blood drive. Sponsore… Please login below or purchase a subscription to the Putnam County Courier to access this content.